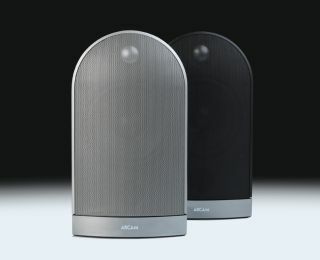 Arcam unveils new Muso speaker | What Hi-Fi? New compact design is available with matching wall-brackets or floor-stands. Arcam has whipped the covers off a new mini-monitor loudspeaker design, the Muso. Priced at £398 per pair, the Muso is a two-way, ported speaker. The compact cabinet (just 27 x 15 x 17, hwd/cm) is made from cast aluminium and weighs a fraction more than 3kg. Behind the grille there's a 25mm neodymium aluminium dome tweeter above a 5in paper/pulp mid/bass driver that sits in a die-cast basket. There's a forward-facing bass reflex port under the grille, too - a configuration that should make Muso easier to site than some alternatives. Around the back are gold-plated speaker-cable binding posts. Muso is rated at 80 watts power-handling at a nominal 4ohms impedance, and is available in black or silver.